The architectural competition was organized by the Dom i Interier magazine and received 965 entries. 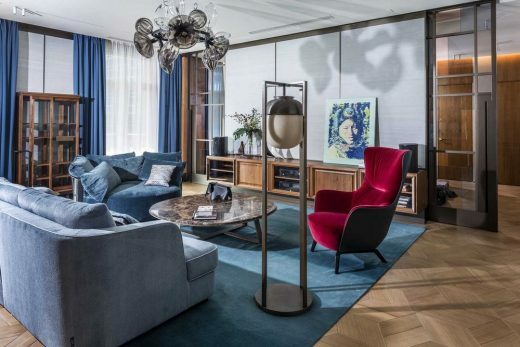 The design commenced with a yacht room 7 metres wide, 15 metres deep and 6 metres high on the ground floor giving access via a 25’ door to a railed slipway in front. 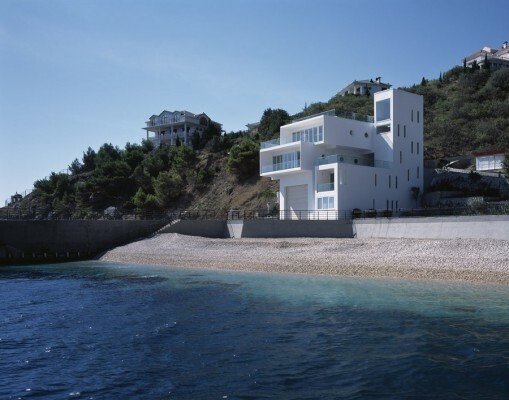 To balance the 25’ door and enable dramatic, unrestricted views across the Black Sea, Robin Monotti proposed three distinctive volumes above and beside the tall boat house. By offsetting the volumes, the design provided a variety of terraces at different levels, extensive views and outdoor access. 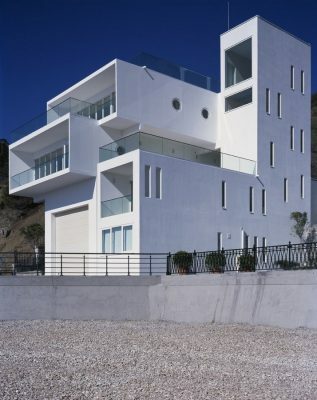 “Yacht house is an organic composition” explains Monotti. 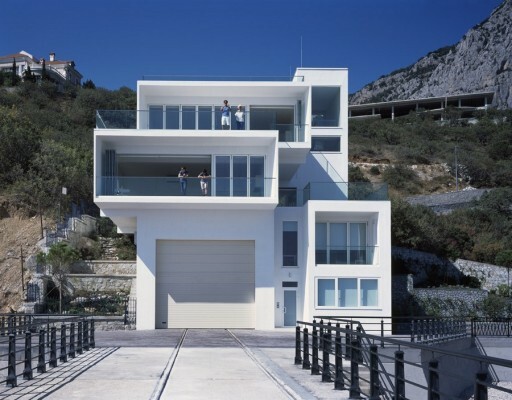 “We started with the box for the boat, then added accommodation alongside, terraces, and finally the stair tower. But ultimately the building is about the nearness of the sea and the huge skies. We wanted people to experience their surroundings – the sound of the water, the sea winds, the changing light and moods, the changing temperatures, even the salty taste in the air – as if they were already on a yacht”. The outside is brought inside by 9 metre wide floor to ceiling windows in the main apartments which provide almost seamless seascapes. When the bi-folding doors are fully open the interior living spaces feel like shaded outdoor spaces. Porthole windows continue the marine theme. Glass railings to all balconies and terraces allow for uninterrupted views, and a shared 135 sq m solarium terrace on the fourth floor provides 360 degree views of the sea and the Crimean Mountains behind. A variety of different outdoor terraces and balconies offer contrasting views over the surrounding landscape. A tall stair tower links the floors and, with its slit-like windows, recalls the nearby defensive Genoese fortifications of Balaklava. The narrow windows restrict light and views so that surprise and delight is enhanced when the main living areas, with their astounding light and views, are entered from the tower. The slit windows also provide privacy on the side of the building that faces the resort. The captain’s accommodation and the first floor flat provide studio accommodation, with two bedroom apartments on the third and fourth floor. The flats are fully furnished with high quality white Italian furniture. The building is constructed of reinforced concrete throughout to make the structure capable of withstanding earthquakes and to provide additional protection against winter storms. There was a conscious effort to reduce light pollution in the outside areas. It was important that the focus for guests at night time would be on the natural landscape, in order for them to witness the reflection of the moon, stars and sea. An influx in outside lighting would restrict guests from engaging with nature and the surrounding landscape. Off-white paint was chosen for the exterior of the building in order to absorb the least amount of solar radiation possible, as well as to enhance the visibility of the building. Porthole windows to the sides of the building provide cross ventilation.